Wet. Meadows, swamps, marshes, streambanks. In water less than 40″ deep. Full to partial sun. This is a 24″ to 36″ tall, erect, perennial forb that rises on a single stem from a thick, creeping, freely-branching rhizome and fleshy roots. It often forms large clumps. 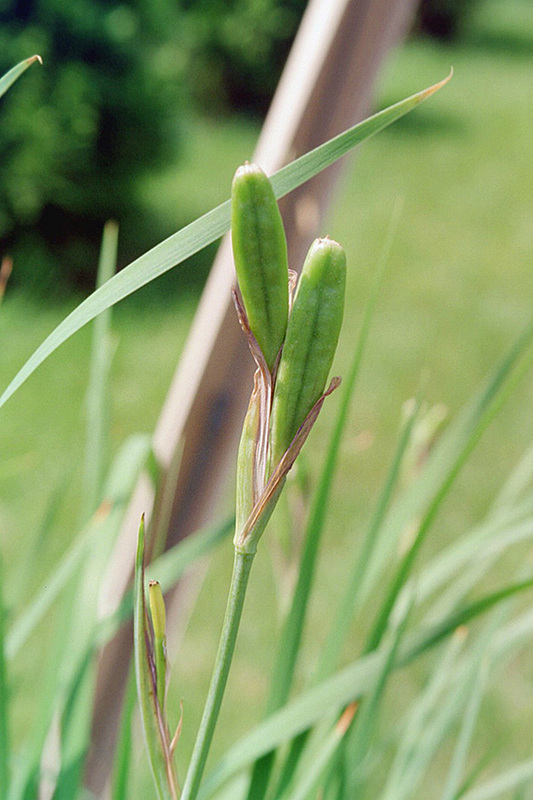 The stems are erect, stout, nearly straight, and usually have 1 or 2 branches. The top of the stem is equal to or higher than the leaves. Basal leaves are narrowly sword-shaped, green to grayish-green, 4″ to 32″ long, and ⅜″ to 13 ⁄16″ wide. They are erect and commonly arching near the top. There are 1 or 2 leaves on the stem subtending each branch. Stem leaves are similar to the basal leaves but shorter. The inflorescence is a cluster of 2 to 4 flowers at the end of each stem and branch. The cluster emerges from an enveloping pair of large bracts (spathes). The flowers are 2½″ to 3½″ wide. 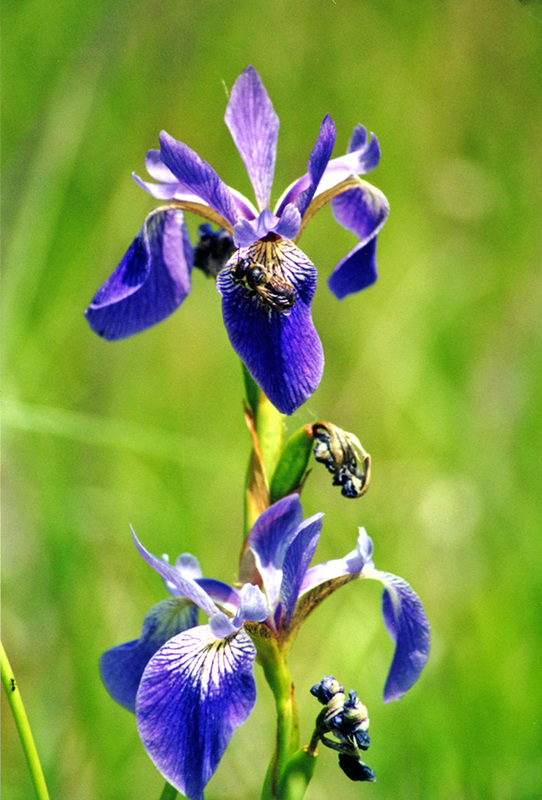 There are 3 petals and 3 petal-like sepals, all of which are fused at the base into a ⅜″ to ½″ long tube. Each sepal is egg-shaped to kidney-shaped, widely spreading, 1½″ to 2¾″ long, and ¾″ to 1½″ wide. It is abruptly or gradually narrowed toward the base (clawed) and broadly expanded toward the tip. 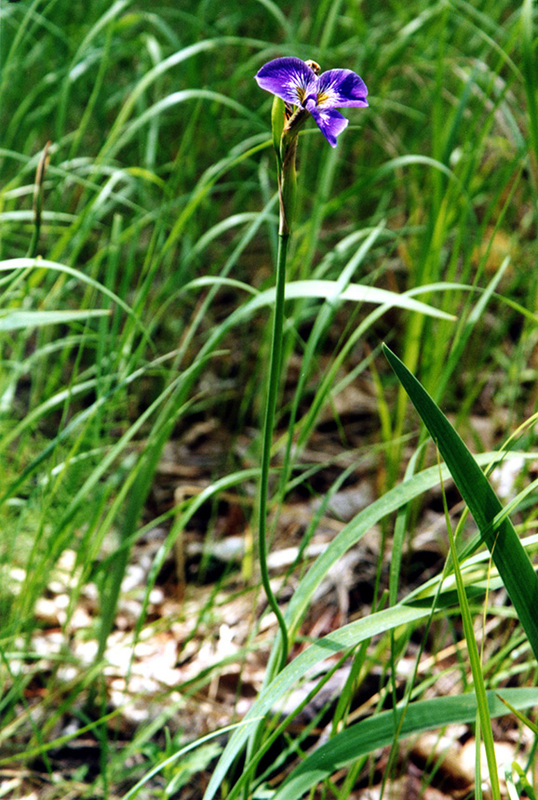 It is violet blue near the tip and white with heavy purple veins from the middle to the base. There is a greenish-yellow patch near the throat. What appears to be an upper lip is actually a branch of the style. The highly modified style is enlarged and divided into 3 branches. Each petal-like style branch covers the lower portion of a one sepal, extending just beyond the narrowed claw and concealing the stamens. The style branch is 13 ⁄16″ to 1⅜″ long, distinctly ridged, and flared at the tip. It does not have ear-like lobes at the base. The 3 petals are much smaller than the sepals. They are lance-shaped, erect, ¾″ to 2″ long, and 3 ⁄16″ to ¾″ wide. They are rarely notched at the tip. The flowers last 1 to 4 days and are somewhat fragrant. All white flowers are found, though rarely. The fruit is a green, oblong, three-sided, 1½″ to 2⅜″ long, ½″ to ¾″ in diameter capsule. It is rounded-triangular in cross section. 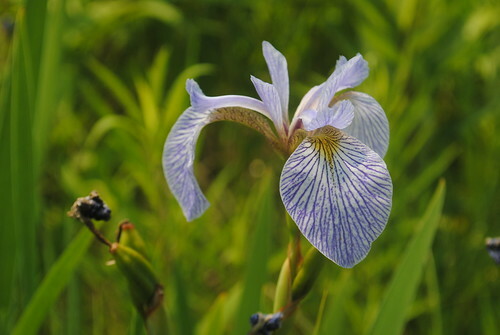 Southern blue flag (Iris virginica var. shrevei) stem leaves often exceed the inflorescence. 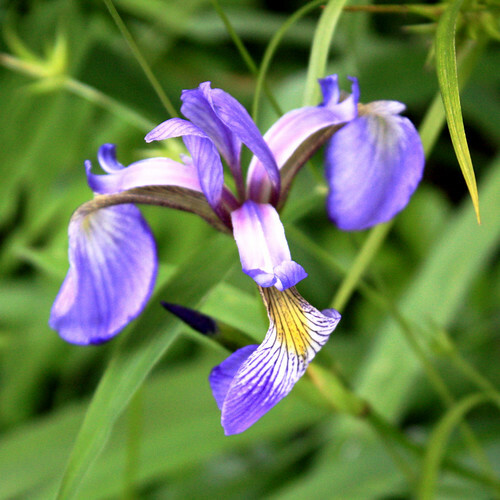 The sepals and petals are lighter in color, lavender to violet. The patch at the base of the sepals is bright yellow, not yellowish-green. The 3 petals are often notched at the tip. 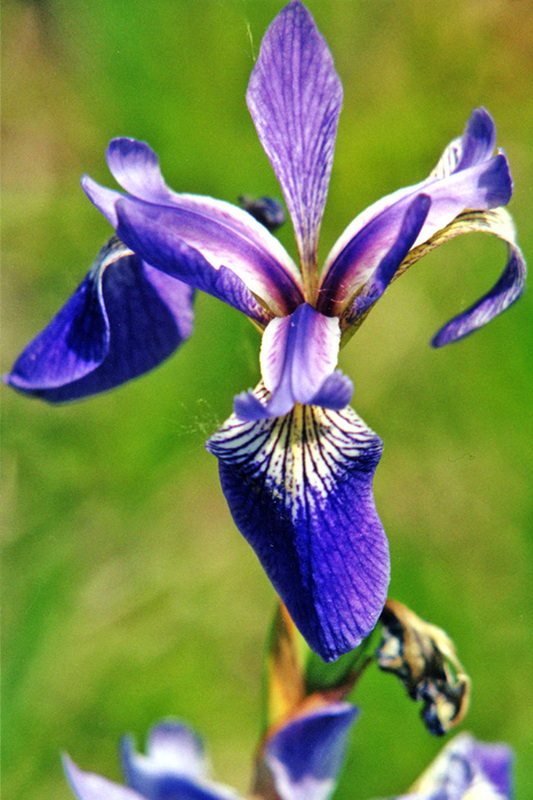 Iris, the Latin for Iris versicolor, from the Latin, "with various colors". 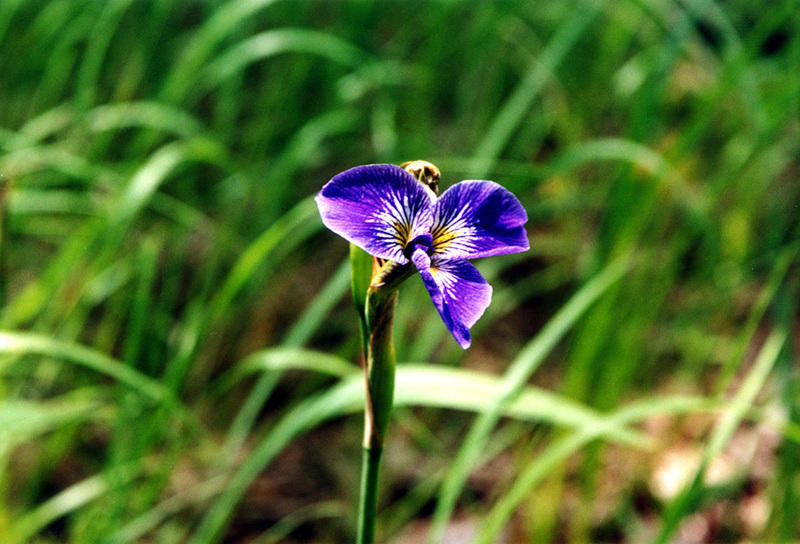 Blue Flag, from its flower color and the old word for Iris. American Blue Flag, Dagger Flower, Dragon Flower, Flag Lily, Harlequin Blueflag, Liver Lily, fleur-de-lis, flower-de-luce. The bluebelt is man-made and abounds with local native plantings and each rock is laid in by hand. 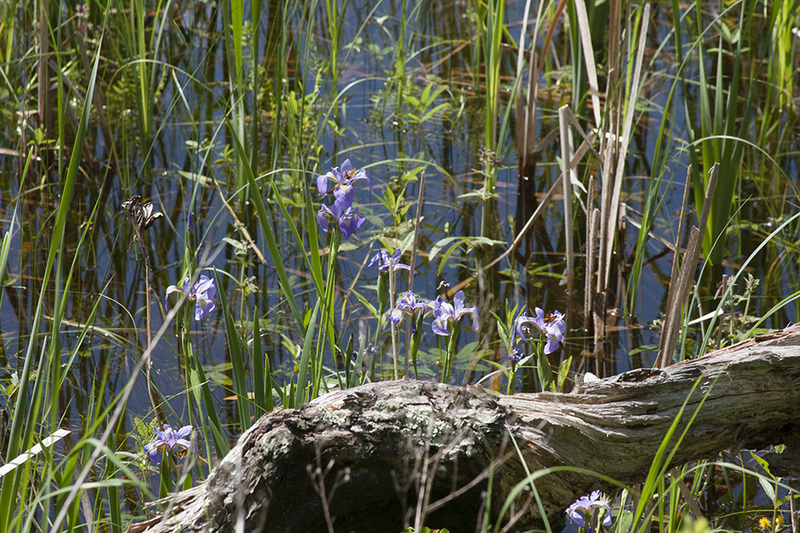 Rich shows off the Northern Blue Flag (Iris Versicolor) around the pond. 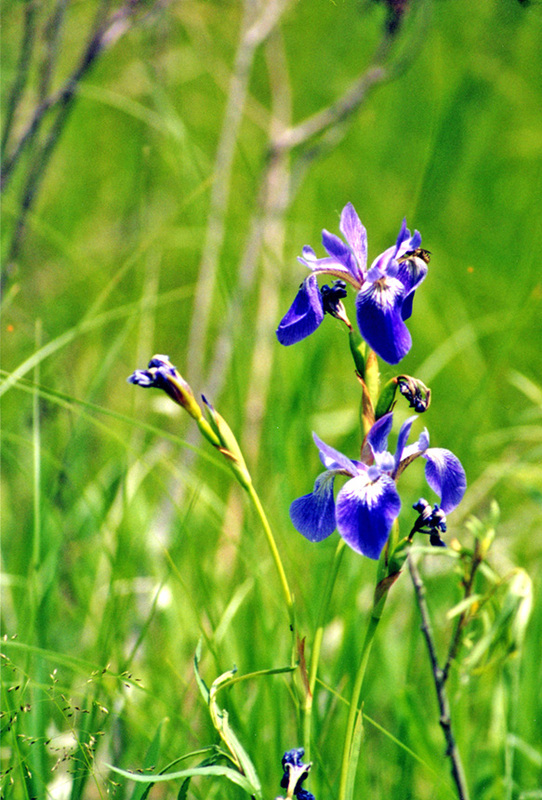 A great plant for a Minnesota native wetland or water garden!